An International Scientists Team is going to unveil the first ever photo of a black hole captured through the Event Horizon Telescope project. The first picture of a block hole would be a historical achievement in the field of astrophysics that will arise the question Albert Einstein’s Theory of General Relativity. 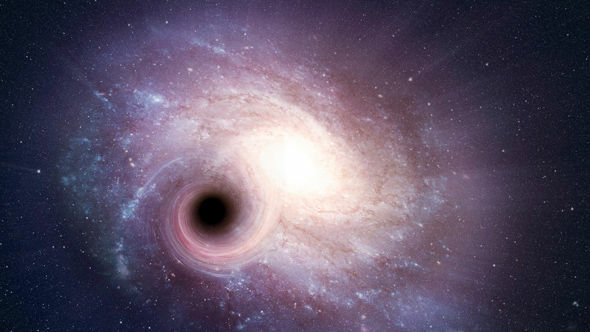 A Block hole is a object so dense that no matter and not even light can escape their gravity and nothing can travel walk up faster than light and no one can escape from inside a black hole is that thing making them extraordinarily difficult to observe. Anyway a black hole relies the same force on something far away from it as any other object of the same mass would.A black hole are in a different shape and different sizes are formed when very massive stars collapse at the end of their life cycle a black hole is a small atom or a big like a large mountain a horizon is a point of no return beyond which stars, planets, gas, dust and all forms of electromagnetic radiation get swallowed into oblivion. Stellar black holes are formed when a star collapses and super massive black hole are equivalent to billions of suns, and expected to exist in the centers of most galaxies, including Milky Way galaxy and Miniature black holes are assumed to have been formed shortly after the “big bang” which is predicted to have started the universe 13.7 billion years ago. The first Picture of a black hole would be historical movement in field of astrophysics it may be question on the Albert Einstein’s theory it will test the theory put forward by Einstein’s in 1915 which is explain the law of gravity and their relation to other natural forces. “General Relativity Theory” allow the scientists to predict the size and shape of a black hole and if the prediction turns out to be wrong, the theory may require rework. At 2017 the journal “National Astronomy published the discovery of a giant black hole” Nearly 100000 times the mass of the sun near the heart of the Milky Way Galaxy the block hole was seen first time in a huge cloud of molecular gas called CO-0.40-0.22The Television Institute of India (FTII) on April 10,2019 announced a course in film Criticism and the Art of Review for the for the first time. This course was conducted form may 28 to June 19, 2019 in Delhi in association with Indian Institution of Mass Communication (IIMC), Dehli.